San Proper is back to SOV for our 2nd EP in 2016. Yes, it’s the Amsterdam rockstar, who over the last fifteen years rocked from major clubs and festivals to smaller bars and dodgy underground locations all around the world. He is well known for his sounds characterized by a mix of different genres. Indeed, it wasn’t easy for us to select only 3 tracks from his sound library. In the end, our choice were the funkiest, the weirdest and high quality tracks from him. 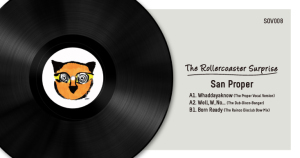 In this EP the track titles will suggest you what is the track about, the A1 track Whaddayaknow (The Proper Vocal Version) is a combination of funky guitar with San Proper’s vocal which made proper grooves, A2 Well, W, No… (The Dub-Disco-Banger) is the version without San’s vocal with mature vibes. The last track Born Ready (The Rainco Disclub Bow Mix) is a revelation of what is himself about – the guy born to be ready to rock the floor with a shaky rocky vibe – and it makes us shake anytime! If you are the one who remembers the funky remix he made for our previous release then this EP wouldn’t disappoint you.